Just finished a big home improvement or construction project? Need someone to come and haul all the debris and clean up the place top to bottom? Well, just get Cleaners Angel to do the job for you, especially if you want it to be finished in a timely fashion, without headaches and hiccups of any sort. We do after builders cleaning in Angel for domestic and commercial clients alike. No matter whether you’ve done repairs in your store/restaurant/office, or you’ve torn down a wall at home, just tell us and we will show up and help you with the clearance. In addition to the cleaning duties that we are going to perform, we can arrange for a truck or a skip to come to your place, as well as a team of industry certified technicians who will load all the construction debris and drive them to a nearby depot for disposal and recycling. We take pride in the fact that despite the high number of people who have made use of our expertise in the field of after builders clearance, we are yet to receive a complaint for a sloppy job. Actually, our skills and dedication to the craft (as well as our clients’ satisfaction) are a guarantee this is not going to happen – ever. Join the large group of our happy customers and you will not regret it. 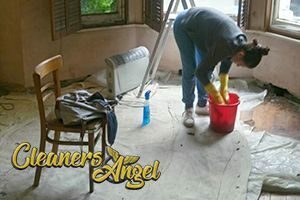 Cleaners Angel is a company that takes quality to a very high esteem. Cleaning up after building projects is a tough job and it requires specialised equipment and powerful detergents, not to mention skills that very few regular people actually possess. But we are not regular people – we are properly equipped, vetted and trained Angel based cleaners who are ready to an extra mile in order to accommodate the specs of your project in the best possible way. Get us on board and you will see what we are talking about. The care for the detail we demonstrate towards even the smallest of jobs out there. When we say that we offer some of the best prices after builders cleaning in Angel services come on, we truly mean it. Domestic projects are done for as little as £15 per cleaner per hour, and £16 per cleaner per hour for commercial ones. Additional charges might be applicable if special tools and detergents are necessary. Just contact our team via phone or email for a free viewing and a free no obligation quote.